A double-purpose play is any play that aims at two purposes in a single move. The move can have either strategic, tactical or both intents. Responding to an opponent's attack with a counterattack aims at defending/strengthening one's own group while attacking the opponent's. Leaning attack, a form of double attack in which a move threatens damage to an opponent's stones but if it is responded to it strengthens an attack on a different group. Much of basic strategy aims at setting up -- at a minimum -- double-purpose plays or denying them to the opponent. Choosing which double-purpose play is the most appropriate for the global position is critical for efficient play, as a double-purpose play does not necessarily guarantee that one's stones are working efficiently together. For example, it may be strategically incorrect to begin a double attack, or an endgame move may be larger than a double atari. A common beginner's mistake is to play a double-purpose play that does neither of its two purposes effectively. These sorts of moves rarely work out and are often played on awkward points that create strange, loose or thin shapes. 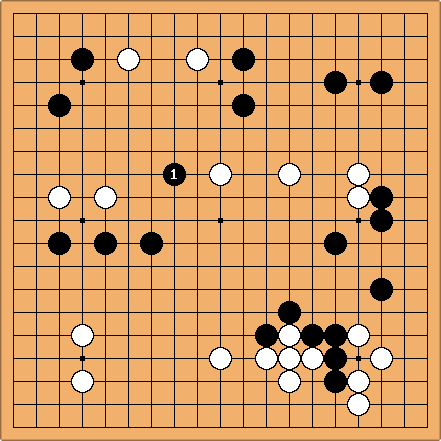 Strong double-purpose plays also consider the other values of go, such as good shape and proper timing. This is a partial position from a game. attempts to build a moyo and protect the corner, but will achieve, at most, one of these purposes satisfactorily. 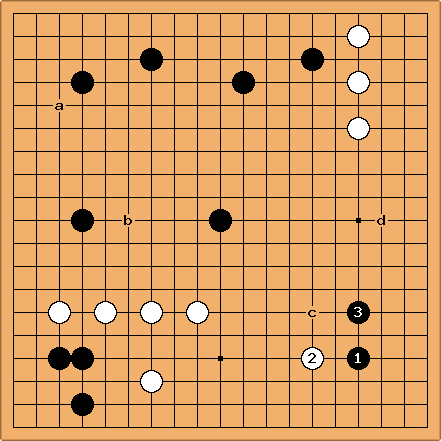 Black's corner is completely open at a and he has a huge hole in his moyo at b. Playing directly at c to secure the corner or at b to build the moyo would lead to an overall better outcome. Sometimes a double-purpose play is incorrect, if it does neither goal well. To me (10k?) it seems fairly obvious that a move in the fourth unoccupied corner would be multi-purpose for white, looking toward making territory and connecting to one or both existing white groups. I therefore want to play there as black to forestall that. I'm not sure exactly where. 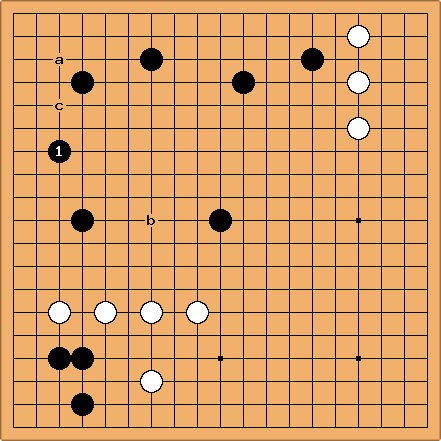 This could lead to a sequence like the diagram below, though, where white has reasonable places for 4 at b, c or around d.
Is going into the corner an error, or just another way to play? How should black handle the follow up? Should he use 3-3 as the 1st move in the corner so an approach move is not sente? mrand I suspect the "partial position" description was an attempt at saying that the whole board shouldn't be studied too hard - the point is to discuss how "dual purpose" justification can be sometimes misguided and that (locally) there are other options that might be better. I'm certainly no expert (being around the same rank as you), but I agree with your basic point that this board position (with an open corner) is not likely in a real game. If this were a real game, I personally like the idea of taking the 4-4 point. Robert Jasiek: When playing a multi-purpose move is correct and the purposes have genuinely different meanings, it is efficient to achieve different purposes simultaneously. When playing a multi-purpose move is correct and the purposes have different names but the same functional meanings, then the efficiency is the same as that of a single-purpose move. When playing a multi-purpose move is wrong because a single-purpose move or a play elsewhere on the board are better, then it is inefficient to play the multi-purpose move. I have studied this and found countless occurrences for each of these cases. Hence, the fake general statement that "They are in general efficient, as they co-ordinate different objectives." is false! Herman: The phrase "in general" means "usually" or "mostly", but not "always". Also, the statement does not say "the most efficient" so all in all the phrase implies nothing more than "usually more efficient than average", which can hardly be called false, I think. RobertJasiek: I see. Even so, writing "usually" would be false. "Sometimes" is correct. RobertJasiek: Efficiency has been used in a colloquial meaning here; what matters is winning chances or improvement of the predicted score. Most moves are multi-purpose moves; e.g., a move defending independent life also defends territory. Single-purpose moves often require a preliminary filtering of other purposes as immaterial. Essentially only afterwards, it makes sense to discuss merits of multi-purpose moves in comparison to single-purpose moves. My strategic advice: always consider relevant purposes, always be aware of moves with multiple relevant purposes but choose a single-purpose or multi-purpose move depending on which increases or maintains winning chances. Thereby, we avoid dubious statements of usually preferring multi-purpose moves.